We are just about a week away from Thanksgiving and just over 5 weeks until the end of the year. 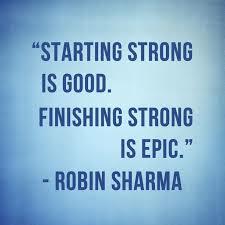 Today I want to talk about finishing the year strong. Let me ask you this; do you have a plan for these last few critical weeks of the year? If you don't have a written plan for these last weeks of the year, I can guarantee you they will slip away from you. Now I'm not suggesting you don't enjoy the holidays, but having a well crafted plan for these final weeks of the year will actually give you MORE free time while you get those last critical tasks done this year. I am hearing form a lot of folks have already pretty much “closed up shop” and have no plans for building their real estate investing business in the upcoming weeks. In fact, their plan is to take the rest of the year off which means they will effectively close down their businesses until after the first of the year. I can tell you that is a big mistake. There is another group of folks that are rushing to the finish line. They are the action takers; the ones that are focused and determined to take advantage of the time left i 2014. Now is the time to take a good look at those goals you made way back in January. You can put an end to procrastination, and still make significant progress in these final weeks of the year. What can you complete before the end of the year that will make you feel great about 2014?